An effort to enable Carles Puigdemont to be sworn in for a second term in office while remaining in Brussels came to a screeching halt on Tuesday, widening a rift between Puigdemont supporters and pro-independence allies of the Esquerra Republicana de Catalunya (ERC, Republican Left of Catalonia) party. 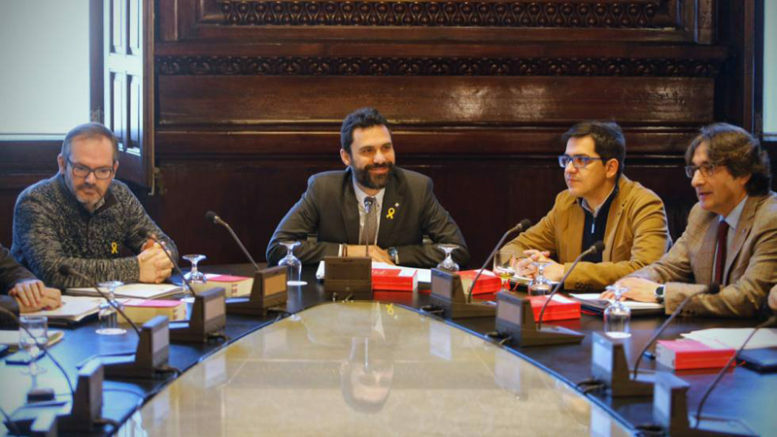 The break occurred when the ERC president of the regional assembly’s executive committee, Roger Torrent, flatly refused to entertain a motion to amend parliamentary rules enabling the “remote” selection of Puigdemont that would have skirted legality and again defied Spain’s Constitutional Court in the process. Torrent, the president of the parliamentary Mesa ejecutiva, refused Tuesday to admit for the committee’s discussion the surprise motion submitted by Puigdemont’s Junts per Catalunya (JxCat) coalition last week, without having consulted in advance with the pro-independence ERC leadership. Prior to Tuesday’s meeting, continuing pressure from Puigdemont’s backers to defy the Tribunal Constitutional ruling that the former president could not be re-elected without being physically present in the regional parliament met with a rotund denunciation from ERC secretary general Oriol Junqueras, who remains in preventive custody awaiting trial on charges of rebellion, sedition and misuse of public funds in relation to events surrounding an illegal 1st October independence referendum and declaration of independence from Spain by the Catalan parliament. Puigdemont is wanted for arrest in Spain on the same charges, but fled Catalonia in early November for Brussels, from where he and his supporters insist he remains eligible to be sworn in as Catalonia’s next president. Torrent’s decision Tuesday lays bare a clear division between the pro-independence forces in Catalonia in terms of strategy and ultimate aims. While Puigdemon’ts backers in the JXCat coalition and his own Partit Demòcrata Europeu Català (PDeCAT, Catalan European Democratic Party) push for his re-election as president at any cost, the ERC is now opting for a gradual approach within the legal framework imposed by the courts in order to regain control of the Catalan government, which was placed under direct rule from Madrid following the referendum and declaration of independence. At the same time Torrent put the brakes on the plans of Puigdemont supporters in the Catalan parliament, he also said Tuesday that he plans to file a complaint with the European Court of Human Rights in Strasbourg. Torrent said he wants the court to decide on the Spanish courts’ rulings blocking Puigdemont’s “remote” candidacy for re-election and to issue an injunction that would force the Spanish courts and government to allow the Puigdemont election to go ahead. Torrent’s planned court filing angered Puigdemont’s supporters, who said they had not been consulted and said the move would likely hurt and not help Puigdemont’s efforts toward re-election. According to news reports, the European Court of Human Rights rarely issues injunctions in such cases, having only done so in 7.5 percent of the cases it considered last year, indicating a clear possibility that Puigdemont may not receive a favourable ruling from the Strasbourg court.